Originally, the ShipLINES hull generator aimed to apply the same approach used in YachtLINES to ship hull forms. One of the most important characteristics identified during development was that surface fairness could be clearly be identified by equivalent fairness and distribution of points in the control polygon. Compared with yacht hull forms, ships have the potential for many more different shapes and with the parametric hull generation approach each of these shapes needed to be described using numbers. This results in many parameters with unclear descriptions and relationships to the physical parts of the surface which are being controlled. The hull form is generated by blending the shape of the control polygon rows of the surface between columns of control vertices defined on the bow, parallel middle body and stern. The column control points at the bow, parallel middle body and stern are placed using geometric rules driven by the input parameters entered by the user. 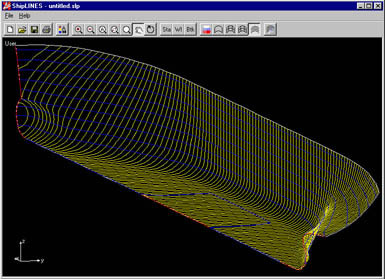 Local features such as the bulb and stern bossing are described by detailed parameters and can created in the control polygon columns before the surface definition is blended longitudinally. The number of parameters and features used to define the ShipLINES hull surface is fairly significant leaving little room for control of the surface in regards to hydrostatics on top of the existing surface specification. However, the existing parameters may be manually modified using the Quick Hydrostatics tools as a guide. The standalone version of ShipLINES is available from the downloads page. An illustrative example of the use of the ShipLINES surface in PolyCAD is shown in this demonstration.